If small and local businesses could embrace and execute a single marketing tactic this year it should be the art of empathy. Empathy, the ability to understand and share the feelings of someone else and capturing it in return is key to today’s digital marketing landscape. Science is now backing up some critical insights into empathy that business should heed. In a recent study published by the University of Zurich, it was found that empathy with strangers is something that can be learned. Since most of your prospects and even repeat customers all started out as strangers to you and your business, this research should cause you to stop, listen and learn. Building empathy with your target audience through the content, interactions and experiences is key to today’s complicated world of digital marketing. At the very minimum, brands need to understand their prospects in order to more effectively market their products and services to them. Taken to the most effective level, local small businesses should be building personas that detail an understanding of the challenges, behaviors and details of their customer. This is where empathy for them and the challenges they face begin to progress into empathy. In order for your business to truly empathize with your customer, it requires multiple interactions with them in order for the empathy to take hold. Conversely, if you want your marketing messages to build empathy with your prospects, it requires the same. Connecting with and building relationships with your target customer is exactly what social media marketing, content and storytelling is all about. But how do you do it? Before we draw the connection of empathy to digital marketing, let’s first take a look at some of the key points of the science of learning to empathize with strangers. The University of Zurich research points out a few key insights that we will use to make marketing connections later. As you review these insights, make your own correlations to what your small business is or could be doing locally. Conflicts between people from different nationalities and cultures often stem from a lack of empathy or compassion for “the stranger”. More empathy for members of other groups could thus encourage peaceful coexistence. 1- We can learn to empathize with strangers. 2- Positive experiences with people from another group trigger a learning effect in the brain, which increases empathy. 3- Only a few positive learning experiences are required for a person to become more empathic. 4- The more positive experiences one has with another group, (strangers) the more empathy results. As the study shows, empathy for those you know is typically far easier for members of your own group. When it comes to building empathy toward and garnering it from complete strangers or prospective customers, many of us are at all loss. What this study clearly points out is that positive experiences are what build empathy across groups or with people that don’t know each other. 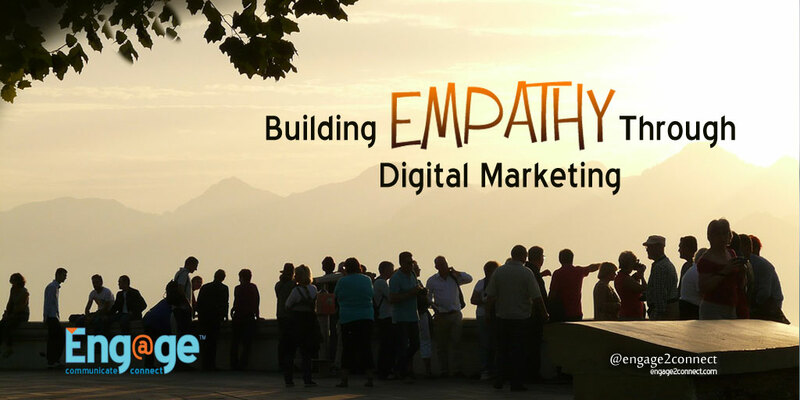 From a marketing perspective, empathy should be driving your digital marketing. Whether it is content creation, product messaging or your social media presence, empathy can build bridges to your customers. The thing is, empathy is difficult to fake and appear authentic, so you really do need to learn to understand and share the feelings of your customer at a detailed level. Small business marketing should take the findings from this research and use it to completely overhaul the push marketing efforts many are known for. Exchange such dinosaur tactics for experiences with your target audience that improves your ability to truly understand them and their needs. Use the empathy you have learned through these repeated interactions to construct content, stories and experiences that will in turn allow you to garner empathy FROM your prospects and make them feel that you understand, care and are addressing their needs with your products. Having a grasp of empathy learning and empathy building with and for your customer is likely going to be the easy part of your digital marketing transformation. Turning what you learn and the empathy you have established into that great content, story and experience is going to be the more difficult challenge. There is a fine line between customer experiences and a straight out pitch that says BUY FROM ME. Understanding the difference and how to execute it effectively is where results come from. Does your small business marketing display empathy?